Just who is LAWS Inc? Find out more about LAWS inc and Patricia Meyer. 2019 is a National Contract Year! Will your UAW negotiate for YOU? 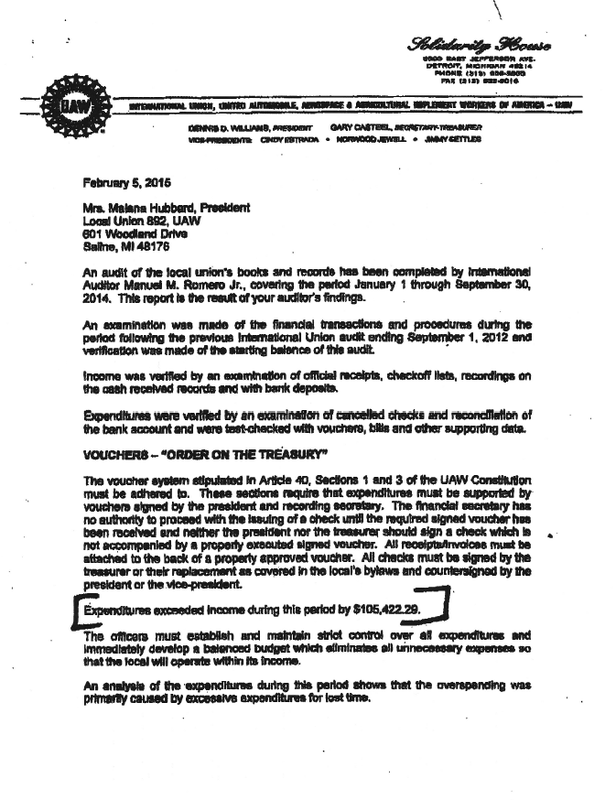 Is the UAW a “bribed tool of management” as stated by the WSWS organization? Many UAW members think so! Norwood Jewell and others guilty of taking bribes from Chrysler corporations. They are the ones who got caught. Now former President Williams honesty is being questioned. They certainly were not working in the interests of its membership. How many others are corrupt? Temps are being used to create unrest in the workplace. They are being exploited by the very union they pay dues to in order to work. They are unable to file grievances. causing bad feelings between workers. out of their meager wages! during the local and national contract ratification votes! low-payed temporaries with no chance of becoming permanent employees. across the nations by not allowing communication between the locals. Attend your local meetings. Demand that the UAW negotiates for You! and all laid off workers be called back before others are hired! Communicate between locals so all will be informed what is happening! Workers need to know the truth and you can help! Are you willing to post this information on your local's website or share it others? We give you permission to copy and share any information from this site. As always we wish you well! Please keep us informed as to what is happening at your workplace. is well supported and attended. and to eliminate nearly 15,00 production and salary workers' jobs. of every detail before you agree to anything. and in your retiree meetings. in your plant and in others across the systems. As always we wish you our best. The following article about workers was brought to our attention. It speaks to the struggles you workers endure everyday to earn a living for your families. Later this month, Gov. Rick Snyder will deliver his final State of the State speech at the Capitol. For every governor, this speech is a rare chance to speak directly to the people of Michigan about the challenges and opportunities facing our state in the year ahead – and, more importantly, it's an opportunity to propose a bold agenda for building a better Michigan for everyone. Unfortunately, during his seven years in office, Snyder has turned each of his State of the State speeches into a long lecture filled with happy talk, where he cherry picks a few rosy statistics from his trusty dashboards, while ignoring the real problems working people face in our state every day. We deserve a governor who will be straight with us about the very real economic challenges our state is still facing, because the truth is, no matter how high the stock market climbs. There are still far too many children in Michigan growing up in poverty, and far too many people living paycheck to paycheck, working unreliable hours, with few or no benefits, and without a secure retirement. It's easy to understand how we got here, because Rick Snyder, Bill Schuette and Brian Calley have spent the past seven years rigging the rules of our economy to favor their wealthy corporate donors at the expense of regular working families. Republicans in Lansing raised taxes on working families by eliminating the child tax credit and creating the Snyder Retirement Tax on seniors' pension, all so they could give a $2 billion tax break to wealthy corporations that send jobs overseas. Snyder signed countless laws like the Emergency Manager Act, which it could be argued caused the Flint Water Crisis as well as “right-to-work,” which takes away the freedom from working people to negotiate together for a fair return on our word. Lansing Republicans sided with the DeVos family and corporations to redirect $1 billion each year away from out neighborhood schools to unaccountable for-profit charter and cyber schools. The results have been a total disaster for working men and women. According to the most recent United Way ALICE Report, 40 percent of households in Michigan cannot afford basic needs such as housing, child care, food, health care, and transportation. More than 20 percent of ;Michigan children are living in poverty, and 44 percent are living in low-income families, according to the 2017 Kids Count in Michigan report. Working families simply can't afford a third term of Snyder's failed economic policies – which is exactly what Schuette and Calley represent. We need a new direction in Michigan. It's time to start building an economy that works for everyone. as she takes over the leadership of our state. Our state and our whole country is in crisis! Now, many of you are threatened with plant closings and job losses. instead of supporting its paying membership and retirees. Make sure that you know what is happening in your work place and others. need to stand together and become a united front. that they need to support their membership! Make sure that you keep informed! Make sure that you fully understand any offers you receive! Remember to keep us informed! Your work is important to our nation! the auto and auto suppliers' workers! to jobs they should not have to be on. Temporary workers are being allowed to do their former jobs! Legacy workers, are they trying to get you to quit or retire? you can become legacy workers. Your contracts only run for 4 years. Everything can change! Lay offs and shut downs keep messing with your seniority. are trying to remove all legacy workers. What will be left for you to gain? Workers are still being harassed at the Chicago plants. into the massive assembly that builds the Chevy Cruze. and replace them with temps. ​ to take jobs formerly held by plant workers. A similar agreement was signed at the Lake Orion plant outside of Detroit. Now we are hearing from Flatrock, MI workers that the same thing is happening there. with no say and no UAW support. while still paying union dues but receiving no UAW support. Remember! It is not the temporary workers' fault. They are only trying to earn a living to support their families! It is time to demand that the union stand up for your jobs and your rights! You must begin talking to and supporting each other! If you are threatened you must make a police report. Attend you local union meetings and take action. Vote for those who do the job properly. Communication between locals needs to be re-established immediately. It is your future at stake! After working with workers and retirees from all across our country it has become apparent to me that the UAW has become corrupt and a “company union.” Its international leadership and often the local leadership are not working on behalf of its dues paying membership. The actions of the leadership need to be investigated and they need to be held accountable for their actions. Misuse of funds – most recently the misuse of the strike fund interest to build a retirement home for former UAW President Dennis Williams, Jr at Black Lake for over a million dollars. No communications between different locals – Workers are being kept ignorant of what is happening elsewhere. Retirees fear loss of VEBA health insurance and pensions. This year their monthly payments for health insurance stopped. Why? Where did this money come from finance the VEBA? Does this mean that the VEBA is in danger of being dropped? Remember 2019 is a National Contract year. Both workers and retirees attend your local meetings. Support one another at the workplace. What is your $2.00 a month dues being used for? Are you receiving any representation from the UAW? Do you have any say in what happens to you as a retiree? Is your money being used for health insurance? The answer to all of these questions in NO! In June of 2018 a wife of a GM retirees talked with a UAW assistant to the then president Dennis Williams, Jr. about retiree concerns including the VEBA health insurance. He told her that the UAW president doesn't have anything to do with the health insurance for retirees and that the union doesn't negotiate for retirees. Any changes to the VEBA can only be through the courts and a board of directors. He also stated that the VEBA was created to protect workers from losing health insurance if the company filed bankruptcy like when Chrysler filed for bankruptcy. We know the VEBA was created when the UAW negotiated with the auto companies to take over the health insurance because they had fallen on hard times. The VEBA is now a trust which is suppose to support itself. It will only last as long as the money holds out. You need to attend your regional retiree meetings and ask these questions. Stay up to date on what is happening to your health insurance. What about your health insurance coverage? Will you have VEBA coverage when you retire? There is a new Facebook page available where you can post, share your opinions and discuss with others. You are all welcome at union workers & retirees united. 2019 is a contract year! who is suppose to stand up for you! UAW members need to communicate with each other in the plants, at local UAW meetings. Information needs to be exchanged with other plants and UAW locals so everyone knows what is going on across the country. All dues paying UAW workers, whether they be legacy, tier 11 or temporary, deceive proper representation from their union. All workers doing the same job deserve equal pay and representation. Tier levels and temporaries levels should be eliminated and all workers equal. Retirees deserve to have a say in what is happening to their health insurance and in their union. formerly held by plant workers. ​with no say and no UAW support. Attention All Workers and Retirees! through the efforts of Illinois State Representative Barbara Wheeler. sexual harassment to occur in the Chicago assembly plant. For many years we have fought the corruption in the leadership of the UAW. serving as UAW representative at Chrysler. A week ago a retired UAW worker who knows Norwood Jewell saw him. Jewell told him he was officially retired from the UAW. He stated that he was given a job by the UAW International to work on another project. is still allowed to work for them. ex-UAW President Dennis Williams, Jr.
knew and okay-ed the misuse of funds. We intend to continue to fight corruption at all costs. Pleas keep us informed about what is happening at your workplace. and to stand up for one another! Gary Jones is your new UAW president! “We're in for a battle. A battle for the UAW and the existence of the middle class. about could not be more important than it is today. and to those working under similar condition across the country. The chairman ruled out of order an amendment that would have exempted low-paid second tier and temporary part-time workers from the 25% dues increase imposed at the last convention. Instead, the delegates approved the continuation of the deduction of 2 ½ hours pay a month for union dues, saying that this was necessary because labor is under attack. the corporations and their suppliers. Retirees are concerned about their health insurance. Retirees and workers must work harder to heard and to insist on changes. The topics to be discussed are of concern for all citizens. Company/Unions: Working Together As One? It takes all of us to bring about change! It is time your thoughts and concerns were talked about publicly. Students, workers, retirees. Your opinions and concerns about current issues are needed! You are invited to come Join Us Looking For Justice in America! It Takes All Of Us To Make Changes! We have recently experienced an inconvenient incident. Our email account was hacked! needed money please know that is not true! bogus messages to all the contacts! into the offices is Washington D.C.
to the agencies and officials we have dealt with over the years? This has been an imposition for us all. next week for all who wish to contact us. Please feel free to send us information once more! regarding sexual and racial harassment in the workplace. Please share this with your fellow workers and friends. Illinois State Representative Barbara Wheeler has filed a resolution to fight sexual harassment in the workplace. This resolution came about after a hearing held by the Illinois State Assembly Sexual Harassment Task Force where testimony was heard from several women who work for the Ford Motor Company Chicago plants. Since this hearing Ford has publicly recognized the situation and are working to correct it, however, the involvement of the local UAW officials and other UAW members has been carefully hidden. House Resolution 783 will be presented to the Equal Employment Opportunity Commission, the Illinois Department of Human Resources and the United States Labor Department. This Resolution urges the federal government to launch a thorough investigation into the UAW and the Ford Motor Company and to look into all aspects of this harassment. Representative Barbara Wheeler is asking that all of the states take such action to stop harassment in the workplace. Patricia Meyer, Director of Labor Advocates Workers Solution, a not-for-profit agency trying to help workers, retirees and their families for 20+ years is working with Barbara Wheeler on this issue. Information is being sent to our state representatives suggesting similar action be taken to request an investigation into sexual and racial harassment in the workplace and the depth of UAW officials and UAW members involvement. It is time for everyone to step up and do their part in stopping this type of behavior in the workplace. Contact your congressional representatives and demand action. in the workplace contact someone for help. and the UAW Local and International Officials. and tell your friends about it. Please encourage other states to pass something similar. to clean up the workplace environment. Please let us know how you feel about this. The atmosphere in the workplace has changed over the last 20 years. There was a time when you, as workers, would have looked forward to going to work. Workers now tell us everyday how the corporations and the UAW have become a partnership leaving the paying members without representation. Many workers are even afraid to go to work because of personal safety issues. UAW officials and workers toward each other in some workplaces. Sexual and/or racial harassment is not acceptable behavior. I understand that 100 workers were interviewed for the Times article. These actions are a huge problem at the Ford Chicago Assembly Plant. Ford was forced to publicly admit the problem exists. They even brought in Hackett to meet with a few selected women. They carefully avoided meeting with any who were in the newspaper or involved in a lawsuit against them. He is not the only UAW member involved in this type of harassment. Shame on those who participate in such degrading actions. Coby has since been reinstated by a mediator. We understand that Jeff Bacon is now doing his job in the plant. Coby has been seen sneaking in and out. Information about this situation has been sent to Illinois Representative Barbara Wheeler. A meeting will be held at the capital in Springfield dealing with several issues including harassment later this month. to make a change the atmosphere in the workplace. to come forward with what they know is happening. at 269-998-4609 at any time of through kimshee97@att.net. Let them know what is happening! the more they will pay attention to what you have to say. May 2018 be good to us all! Know that we are working hard on your behalf. Unfortunately we can only do so much! You need to become part of the cure. Take the time to check the news everyday on the internet or your cell phones. The media is telling more about what is happening to American workers. There have been reports about some of the UAW infractions. Harassment issues involving UAW and Ford have been brought to light. GM has made a public statement against harassment in the workplace. It is up to each one of you to help bring these issues to light. Keep yourself and those around you informed. Attend you local union meetings. Unfortunately some of your joy may be laced with concern about your future. Accusations about wrong-doings by UAW officials are being reported again. Just the other day Joe Ashton was added to the growing list. Norwood Jewel is leaving his post in January, several months early. Cindy Estrada and Dennis Williams, Jr. have shut down their charities. How sad it is for those who counted on their donations to help other people in need. and beg their membership for forgiveness and promise to clean up the union. They need to held accountable for their actions. A new IUAW president will be named in 2018.
misrepresentation and under the table actions and agreements made by your leadership. These changes affect your jobs and your family's lives. Almost everyday I receive phone calls from workers seeking our help. How sad it is that an outside agency is needed to try to correct and support workers. not siding with the corporations. Remember to help each other! It is up to every worker to stand tall and help each other be safe and protected. Do not let bad leadership influence you into being part of the problem. Help each other on the floor! Attend your local meetings and be heard! Stand together and be part of the change! GM has publicly announced a non-harassment policy for its facilities. GM workers make this a reality! All corporations should have this policy in place and enforce it! Supervisors and UAW officials can not be allowed to be part of the problem. Some Ford employees are being offered an early buyout. Make sure that you fully understand all of the offer before you sign any papers. to agencies that will be able to help you. or my secretary at kimshee97@att.net. It was a very busy and interesting day. We are now waiting to hear back from them. I am sorry to report that I have been receiving complaints from different areas of the country about the actions of UAW leadership, company officials and, unfortunately, bad behavior on the part of workers toward each other in some workplaces. Everyone deserves to be treated with respect by your UAW leaders, UAW and company supervisors and especially by your fellow workers. Racial discrimination and/or sexual harassment is never acceptable! If you are experiencing problems in your workplace and are not getting any help from your UAW leadership or your employer you need to contact an outside source. Consider contacting your state and/or your national representatives. Keep us up to date. Remember, I can be reached at 269-998-4609 or at kimshee97@att.net. On October 3 I had the privilege of speaking to a class of apprentices at the South Bend and Vicinity Electrical Joint Apprenticeship in South Bend, Indiana. Labor instructor Don Winter invited me to present what is happening in labor and it's affect on our country. I found these students eager to listen and not afraid to ask the hard questions. Hopefully this attitude will be found in all of the new generation of workers in our labor movements. If you have any information that you think we should know please feel free to contact us through this website. We are still fighting for you. Remember to talk to each other and to stand up for your fellow workers. Only by working together will things improve. It fills me with sadness to think of what has happened in the last weeks. The storms have affected so many people. Too many people have lost everything that they have worked for all of their lives. and to work together to help in any way that we can. Our country will only survive if we stand strong and help one another! I encourage each one of you to do what you can do. Every dollar, bottle of water or donation of food will help someone in dire need. to celebrate all workers in our country. are the backbone of our nation! Without you we would accomplish nothing! We, L.A.W.S., are here to help in anyway we can. Keeping standing up for what you believe! Dispute This 2017 is here! It is a must read for all workers and retirees! I wrote this book to bring to light what is really happening in society today to both the white and blue collar workers. Young people are confused and don't know what type of training or schooling they should pursue for employment in the future. I try to answer their questions along with providing important information about our society today, how it affects our daily lives and the steps we can take to improve things for the future. I bring to light what it is really like to work in the auto industry today. The American automakers and the UAW are working hand in hand. What is happening to workers is being very carefully hidden. They do not feel that they are being represented properly by the very organization that they pay their dues to and by whom they should be supported. Retirees have no vote and fear the loss of healthcare and pensions at the most vulnerable time of their lives. told by real workers about what is happening to them in the workplace. We applaud them for having the courage to come forward! Their stories need to be told! Your book or books will be sent to you by return mail. Now is the time to step forward while the news media is interested in what is happening in the UAW. Send your opinions to the Letters to the Editors section in your local paper. Contact us with information you think we should know. Attend your local UAW meetings and speak up. In the article UAW President Dennis Williams, Jr. states that the UAW had no knowledge of any wrongdoing. He must be hiding his head in the sand! officials at all levels and have been completely ignored. the automotive industry with stories by fellow workers. Be part of the cure not part of the problem! who have given their lives to keep our country safe. and to make America a country to be proud of! Here are some new articles for you to read. Keep on sending us information. Only by sticking together will changes be made! As workers you need to be aware of what is going on. don't have time to watch the news or read the newspapers. As we all know an informed person will be able to make better decisions. ​that I think would be of interest to you as workers. in the Google or any other search site you wish to use. We have heard about your petition asking your local UAW leadership to address your concerns. Were you able to attend the meeting dealing with the petition? signed the petition to attend one meeting! we are willing to act as a go between. Make sure you include your signature. We will need your information by June 1, 2017. 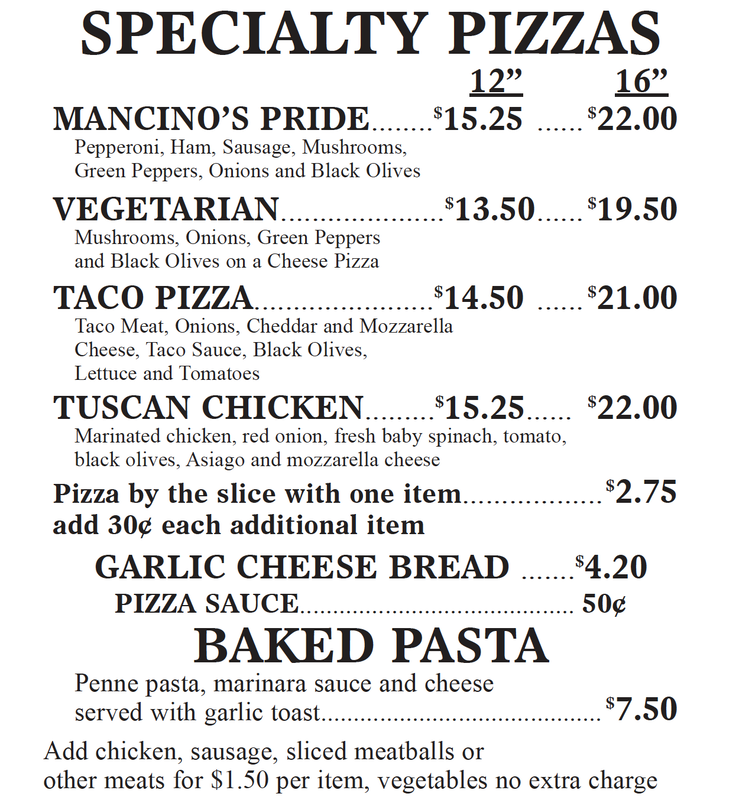 If you have any questions please contact me at 269-998-4609. Don't give up! Continue to stand up for your rights! Please report to us and/or UAW President Dennis Williams,Jr. your concerns about your UAW leadership. Do you have any questions about what is going on in your local? Are you concerned about what is happening in your workplace? Make sure that you attend your local union meetings. Go prepared with questions that you need answered. Have the courage to stand up at the meeting and ask your questions. You have a right to have your questions answered. Remember to stand together as a group. through this website, or through kimshee97@att.net. Please put disputethis on the subject line. I know that we are all looking forward to Spring! We are all ready for flowers and warmer weather! our workers, retirees and their families. Keep up the good work. Remember to stick together and to help your fellow workers. By working together we may bring about change! Our fight for justice is still ongoing! LAWS, Inc and Congressional Education and Workforce Committee. Please continue to share your concerns with us. Remember you need to stand together ! Enjoy your time off with your families! Keep watching this sight for breaking information next week. On December 19 a decision will be made by the Frankfort, IN prosecutor as to whether Robbie Pippenger's case will be brought to trial. of the employees to be switched. He immediately went to Dan Frey in the HR department and told him. Since he has seniority to displace an employee on 2nd he filled out a slip that Federal Mogul provides to use his seniority to remain on his. Dan Frey said that he would talk to the chanting employee about her actions. Mary Payne and Robbie are stewards but they have not been given keys to the UAW office in the plant that has the grievance forms. Robbie and Mary are unable to perform their duties. Patty Frigo, Joanne Katzman and Al Smith are on the election committee. Al and Joanne Katzman were given keys to the Union Hall office but Patty was not. Makes you wonder if someone has something to hide! 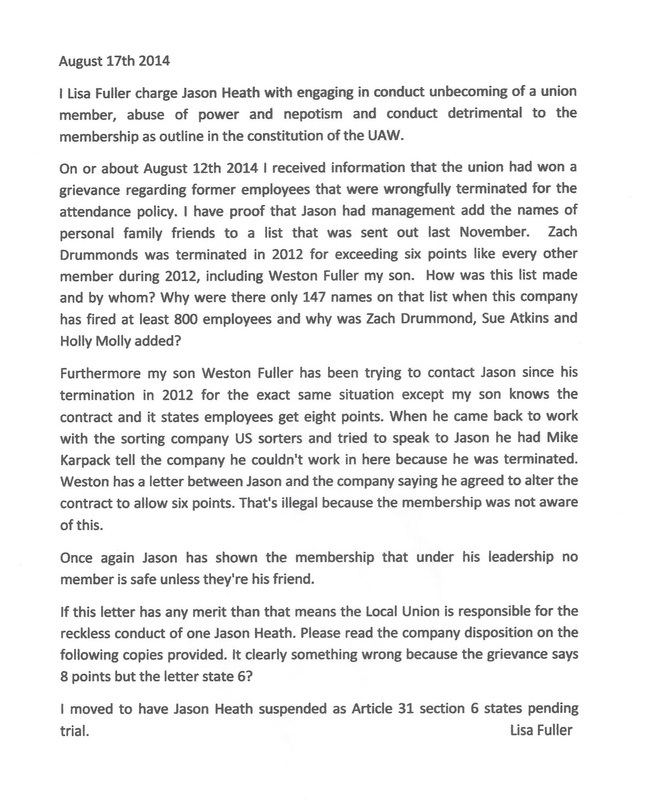 Following is the response Robbie Pippenger from UAW Local 1949 received from UAW International regarding his letter to UAW President Dennis Williams,Jr. Your e-mail to President Williams has been forwarded to me for investigation and response. After communication with our Region 2B office, I have been informed that they are aware of the issues stated in your letter and are in the process of investigating these concerns. They have assured me that you will be provided an opportunity to have further input in the investigation process. Please let me know if you are not contacted in the near future as stated. He responded to Chuck Browning with the following. Thank you for your email. Region 2B is aware of the issues in my letter as I spoke with Ken Lortz by phone. Ken Lortz admitted that Mark Caldwell should not have made the threat. Mark Caldwell never talked to me about what happened. He believed a committee person when she lied and said I interrupted her during a grievance investigation. When I was threatened by Mark Caldwell was in the role as UAW Local 1949 President. As stated in my November 30, 2016 letter to UAW President Dennis Williams,Jr. on October 9, 2016 at a union meeting my previous positions were given back to me by Acting President Mike Salinas. Ron Dubree was sent by Region 2B to Federal Mogul this last month before the local election. At that time I was told that I had to give up my position as steward in order to be able to run for Vice President of Local 1949. The fact that I would have to give up my job as steward was a stipulation to run, however, Tim Newman did not have to give up his job as steward to run. Also, Acting President Mikey Salinas lied and said he didn't appoint me as chairman on the Education Committee. I even had witnesses to this. Where is the fairness in this? As I mentioned in my letter Ron Dubree never talked to me directly about any of the issues and I was chastised for contacting LAWS to help me. After being treated so badly by my UAW local 1949 officials where was I suppose to go for help? I have done exactly like I was told by Ken Lortz& Richard Isaacson about filing charges against the officials of the local union for all the many violations. But they are not doing anything with the charges. They are ignoring them even though I've sent them all by certified mail. As of right now we only have one standing committee that is functioning. That is the veterans committee. I tried to start the Education Committee but they have done everthing possible for me not to start the Education Committee. If you want I can talk to you on the phone or I can email you the complete story. I gave Richard Isaacson the whole story. Have you seen the letter that LAWS, Inc sent to President Dennis Williams,Jr. on November 21, 2016? This letter may be found at disputethis.org . In this letter you will find the listing of newspaper articles which will give you more information. You may find these articles in The Times, Frankfort, IN, www.ftimes.com October 27, 28, and November 1 issues. I recommend that you read them. The yelling, name calling, intimidation tactics and UAW Constitution violations need to stop. Ron Dubree has done nothing to correct the issues I have. He talks only to the committee and it seems like he is only trying to cover his and their behinds instead of fixing the issues that I've addressed. These issues need to be dealt with immediately. All of the local UAW members deserve a local which will represent them honestly with tolerance for all. You need to understand that this is not just a local problem. Dues paying UAW members throughout the country have expressed lack of representation on the part of their local officials and feel that the International is not addressing their problems. I, with many other UAW members across the nation, are working with LAWS to try to clear up the problems in the UAW. As I have been assured that I will be provided an opportunity to express my input I will expect to hear from Region 2B by December 12, 2016 how these problems in Local 1949 will be solved. Be advised that I have shared this information with LAWS and workers within the Federal Mogul plant. The following is the latest attempt by UAW members of UAW 1949 Frankfort, IN to correct the misrepresentation of its local officials. I am sending you this urgent letter because of the flagrant abuses that have taken place at UAW Local 1949. The following tells of rampant disregard for the UAW Constitution, Local Bylaws, state Law and Federal Law. The wrongs include verbal and physical abuse of members! Richard Isaacson is aware of this since we drove to Detroit and meet with him at the solidarity house. On 10/09/2016, Acting President Mike Salinas, in the presence of approximately 11 members, said that I was Steward by acclamation and Chairman of the Education committee again. On 11/13/2016, Patty Frigo and I were the targets of a witch hunt that took place in a membership meeting that was overseen by Ron Dubree (UAW International Rep) and is the nephew of Mark Caldwell. Criminal charges was issued from the Clinton County Prosecutors office due to death threats being sent to me from Mark Caldwell. Since then he has resigned but Ron Dubree is a relative to Mark Caldwell. We were yelled at so fiercely by many that we could not even answer the questions that were pushed at us. In that disorder where Roberts Rules of Order were ignored, Tim Newman was allowed to retain his job of Steward and run for vice president after I was told that I had to give up my job as Steward to run for Vice President. At this time my name is listed as a candidate for V.P., which is a position I want but I feel that the wrong doing of Mark Caldwell needs corrected. I sent a letter to the UAW local 1949 asking for all nominations to be null and void because of the illegal nature of the meeting and the wrong doing of Mark Caldwell removing me as steward and from being Chairman of the Education Committee. I should have the positions of Steward and Education Chairman. I should have had the same right as Newman to run for the office of Vice President without giving up my job as Steward. Why has Alice Bell displaced me on the Education Committee? On 11/29/2016, I received the following information from the Clinton County Indiana Clerk’s Office. Tim Newman, UAW Local 1949 Steward, is listed as an inactive voter. The last time he voted was in the 2004 General Election. This is a gross violation of Art. 9 of the UAW Constitution. I also received information from the Clinton County Clerk about David Timmons who has not voted in the elections of 2014, the primary of 2012, the elections of 2010 and the primary of 2006. Today 11/30/2016 I received the voting records for the new UAW Local 1949 President. He was vice president before Mark Caldwell resigned. The voting records show that he never voted the entire time he was Vice President. I have not yet filed a charge against Mike Salinas for violation of Art. 40 Sec 2 of the UAW Constitution because he did not “attend all sessions of the local union.” We just received a current copy of the UAW Constitution on 10/31/2016 from Richard Isaacson. We had to drive all the way to Solidarity house to get one because Mary Ann Shaw had not given us a copy or the Constitution. We have filed charges on her for that violation. After receiving the Constitution we continue to find more violations. On 11/09/2016 we charged all the current members of the executive board, including ex president Mark Caldwell with violation of Art. 37, Sec 4,5 for not holding a “general membership meeting at least once a month.” Please note that we do not have a work place council or anything in our local bylaws about having a work place council. On 11/09/2016 we charged election committee members Cheryl Large, Cathy Caldwell, 2nd Shift Bargaining Committee person Gerald Brantner, Skilled Trades Steward Tim Newman, 2nd shift Chief Steward Rhonda Dale, Skilled trades committee person Amy Peter, 1st Shift Chief Steward Adrienne Gephart and 1st Shift Bargaining Committee Person Michelle Fivecoate with violation of Art 37, Sec. 4,5 because they had not attended “2 out of 3 membership meetings.” On 11/09/2016 we charged 1st shift Committee Person Michelle Fivecoate, 3rd shift Bargaining Committee Person Lance Royer, Trustee Doug Shaw and former President Mark Caldwell with violation of Art 9 of the UAW Constitution because they had not voted in all “elections for civil officers in the area in which their homes are located.” On 11/15/2016 we charged Mary Ann Shaw for violating Art 40 Sec 4,7 of the UAW Constitution because she had not given a current copy of the UAW Local 1949 Bylaws and the UAW Constitution to each member. We also know that she has not given an “official receipt for the initiation fee” of a member. On 11/16/2016 we charged Jayne Kinslow with violation of Art 40 Sec 3 of the UAW Constitution because she stopped taking minutes in the union meeting held on 10/09/2016 to argue and yell at me, ignored my motion which I was forced to send by certified mail and ignored the charges of 11/09/2016. There is no evidence that the above charges have been reviewed according to Art 31, Sec 3,4! Tim Newman and David Timmons are not politically qualified to hold a office in the UAW according to Art 9 of the UAW Constitution. Why has Ron Dubree failed to bring UAW Local 1949 into compliance with the UAW Constitution ,US Constitution and Federal Labor Law? Why have you and Ken Lortz not put UAW Local 1949 into order? Why has the Federal Mogul Plant in Van Wert, OH been able to strike while we were not able to do so? Please help get this situation resolved. I would like to know that our Local Union is doing what is expected. It has been clear to me that our local union officers and Ron Dubree have been intentionally derelict in following the UAW Constitution and UAW Local 1949 Bylaws. We need answers to these questions as soon as possible. We are looking forward to your speedy response. 5138 E. County Road 550 N.
Letter to UAW President Dennis Williams, Jr. I have contacted you several times about the concerns of your UAW members throughout the country. This is our last attempt. to save job status as Ford employees and the right to be moved to another Ford Facility. Lisa Fuller – Union representatives not filing grievances and telling UAW members they had been filed leading to job loss. Bettina Hilliard – Local election fraud. She followed the correct procedures by contacting the local recording secretary with her complaint. Candice Escott – Company and union working as a unit causing pay shortage. 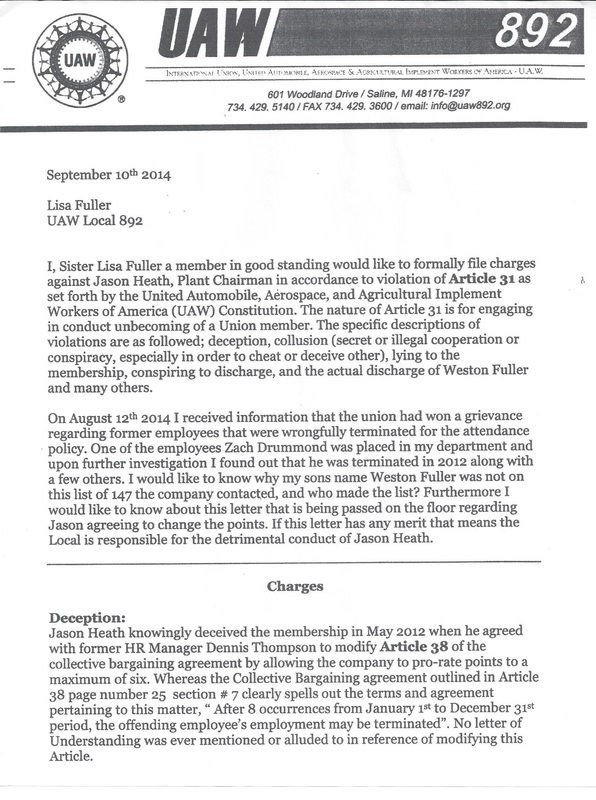 Failure on the part of UAW representatives to write and/or file grievances. Calvin Buckmaster – FICA was wrongly taken out of signing bonus. Ford and GM employees received their FICA money back. Chrysler employees did not. He tried to grievance but was ignored. He worked for two years to get this corrected. He finally gave up. Workers being bused in from the Detroit area rather than using local workers. Laurie Bedard-Nettleton – Lack of representation of the part of the UAW representatives of the Tier 11 employees at the Flint Truck and Bus facility. Laurie Casillas – A special deal was brokered by UAW Representative Jody Dunn to reinstate job seniority of two employees. They were told it had to be kept secret so other Tier 11 employees would not ask for it. Art Pedersen – National contract ratification voting fraud. He followed all of the proper UAW procedures for filing a complaint. David McCuddin – Questioning increase of union dues being put in strike fund. Robbie Pippenger, Pat Frigo – Threats and intimidation by local union officials. At the November 13, 2016 UAW Local 1949 union meeting under the direction of Ron Dubree the election of officers was handled incorrectly. Further information about Robbie's story can be found in The Times, Frankfort, IN, www.ftimes.com October 27, 28 and November1 issues. Since we have been contacted by UAW members from across the country it is clear to me that problems exist both at the Local and International levels. Our goal as an agency, along with your UAW members who have contacted us, is to identify and solve the problems that exist, to remove those who are breaking the rules, and to make the UAW once again a union its membership can be proud of. Your UAW membership needs to be assured that you and your fellow International and Local officials are working on their behalf and not acting as a “company union.” If you are unaware of these problems I will gladly share my vast information with you. Over the years I have been accused of being a union breaker and even a union hater. This could not be further from the truth. I am willing to work with you to help bring about these needed changes. As reported in the 11-10 -16 Pat Speaks Robbie Pippenger and Pat Frigo took information to Solidarity House on October 31, 2016. Richard Isaacson said that they would take measures to correct the inadequate handling of the situation by the local union officials. As a result Ron Dubree, the Regional Rep for Federal Mogul, came to the plant. He held meetings with some employees and Dan Frey of Human Resources, however, he never met with Robbie or Patty Frigo. Apparently the UAW International sent Ron Dubree to put out fires with out correcting the problems in the plant. On 11-13-16 a union meeting was held at UAW Local 1949 Frankfort, IN. I was asked to come to Indiana to advise those workers who were concerned about how they would be treated due to the actions of the UAW Local 1949 officials at the October 9, 2016 union meeting. Some of the employees met with me at the Frankfort, Indiana VFW Hall at 12:00 P.M. One of the things they were concerned about was the assigning of union positions that did not follow union procedures. At the October 9, 2016 meeting President Mike Salinas told Robbie that he had his steward job and his education positions reinstated. At the November 13, 2016 meeting Robbie was offered the opportunity to run for Vice President, a position he had been interested in before. If he decided to do this he was told that he had to give up both his steward and education positions. He was never given the chance to accept or deny this opportunity due to the rowdiness of the membership. Instead his education position was immediately given to another member. Patty Frigo, who carried the petition in support of Robbie Pippenger throughout the plant, was encouraged to accept a position on the Election Committee. She accepted this position because she because she could make sure the election vote was counted honestly. After the meeting Patty was approached by Ron Dubree. He stated to her that she should watch out for Pat Meyer. She goes to small unions to cause trouble for the UAW International Union. He also stated that she would take and/or charge you money for her services. Patty responded that we called LAWS to help us. We have only given her a donation for gas money. I, Pat Meyer, Director of LAWS, will notify the UAW International that we are taking further action concerning the rights of workers at the Federal Mogul plant. Further information on Robbie's story can be found in The Times, Frankfort, IN www.ftimes.com October 27, 28 and November 1 issues. For all of you union members who have suffered at the hands of your leaders, local and international, we want you to know that we are sincere in our efforts to find justice for you. It is your privilege as an American citizen to help elect our new president! The lines may be long but the wait is worth it! but make sure that you vote! On Monday, October 31, 2016 Robbie Pippenger and Pat Frigo employees of Federal Mogul in Frankfort, Indiana took their concerns to UAW Solidarity House in Detroit. They met with Administrative Assistant to President Dennis Williams, Jr, Richard Isaacson concerning union representation and death threats to Robbie Pippenger. Isaacson stated that he would take measures to correct the inadequate handling of the situation by the local union officials. Pippenger and Frigo also brought to light the fact that Federal Mogul HR manager, Dan Frey publicly stated that he could not comment on the situation between Pippenger and the union officials. Robbie and Pat Frigo feel that Dan Frey knows about conditions but does nothing about them. This feeling has been also expressed by other Federal Mogul employees. When the employees of Federal Mogul found out that Robbie and Pat Frigo were going to UAW Solidarity House they asked them to request that someone from their come to Federal Mogul and correct the situation. They feel that their situation is so critical that several are thinking about withholding their union dues until someone comes. please contact me at 269-998-4609 or kimshee97@att.net please put dispute this in the subject line. Today in the Frankfort Times in Frankfort, Indiana there was an article addressing Robbie Pippenger's story and other Federal Mogul concerns. In the article LAWS was erroneously labeled as an anti-UAW organization. Nothing could be further than the truth. We are working to help UAW members clean up the union so that it is once more a proud and vital organization. If you take the time to read my biography you will find that I was a union official myself and I believe in the need for unions in our country. from 12:30 P.M. to 4:00 P.M.
for a drop-in meeting. All are invited to attend. Please spread the word to all. Alert to a situation I have just found out about. On Morning Joe on MSNBC today Dr. Jeffrey S. said that since 2003 the U.S. Congress has had no control of the monitoring of pharmaceutical prices. An example is a drug for hepatitis C. This pill costs $1.00 a pill to produce and costs the patients $1,000 a pill. Without this pill the patient will die. The pharmaceutical company is from Ireland. Please call immediately 202-224-3121 to object to this lack of control. When you call they will ask for your zip code and your call will be transferred to your Congressman's office. This lack of control needs to changed for all of our sakes. Robbie Pippenger of Local 1949 in Franfort, IN is seeking help. He has informed the UAW leadership and UAW members what has happened with no results. of the Federal Mogul Plant in Frankfort, IN. the UAW International’s lack of information for members regarding the proposed sale of our Frankfort, IN plant. they remain loyal union members. If you have any questions or suggestions or information that you think that we should know about this situation or any other situation please contact LAWS through the address or phone number above. If you use the email address please put dispute this on the subject line. On September 16, 2016 Susan Alexander, a LAWS Board Member and I were invited by Federal-Mogul employees to Frankfort, IN to attend a forum concerning Robbie Pippenger's death threat and other concerns regarding the UAW leadership. At the meeting an officer from the Frankfort, IN police department felt the incident should be investigated. Robbie has been advised as to how to handle this incident. As the meeting concluded I spoke to UAW Local President Mark Caldwell. Thank you to all of those who attended the forum and the VFW for allowing us to use their facilities. As you know if you have been reading this website UAW Local 600 played a critical role in the Ford National Contract Ratification vote. There has been questions as to the validity of its results. Ford employee Art Pedersen objected and had a hearing at Local 600 heard by UAW President Dennis Williams, Jr's assistant Al Wilson. Information about ballot box stuffing and other irregularities were presented to him. Shop Chairman Gary Walkowicz testified to the ballot box stuffing. The decision was returned that there was no wrong doing. Art is now appealing this decision to the UAW Public Board of Review. More information about Art Pedersen's concerns and Robbie Pippenger's death threat may be found in earlier Pat Speaks on this site. Of Concern to all Ford workers: Ford has announced that all small cars will be built in Mexico. What does this mean for our American Ford workers? Has the UAW protested this move? How is the union working to protect its members jobs? Federal-Mogul workers have you been told about the sale of your company? How will this sale affect your jobs? Is the UAW looking into this situation and keeping you informed? UAW members across the country keep contacting us. Your information is valuable and helps show a pattern across the nation of lack of action and protection on the part of your UAW International and Local leaders. We are compiling information to pass along to the Department of Justice Racketeering and Fraud division, the Department of Labor Raketeering and Fraud Division of the Inspector General, the Congressional Education and Workforce Committee and other appropriate government agencies. You may contact me through this website or by emailing kimshee97@att.net. Please put dispute this in the subject line. Remember, each and everyone of you is important! Stand up for what you believe! UAW members we understand your concerns. We are hearing the same concerns from UAW members across the country. This day is for you to celebrate your contribution to this country and its economy. Workers are the backbone of our country. Art Pedersen's appeal concerning the Ford National Ratification vote has now advanced to the UAW Public Review Board. Following is the letter we sent in his support. This is to affirm that I fully support Art Pedersen's appeal to you regarding the 2015 Ford National Agreement Ratification vote at UAW Local 600. My organization, L.A.W.S., INC., is a free agency working to find justice for workers, retirees and their families. I have been working with Art Pedersen and many other UAW members who are protesting the UAW International and Local leadership's misuse of funds, misrepresentation, fraud, refusal to write grievances or when they are written they are 'lost' or 'shelved' and never acted upon and voting violations. On May 24, 2016 I acted as council for Mr. Pedersen at a hearing held at UAW Local 600 conducted by Al Wilson, assistant to UAW President Dennis Williams, Jr. Mr. Pedersen was told by Wilson that all information concerning the complaint must be presented at this time and that his decision would be final. After a lengthy three hour meeting is was apparent to Mr. Pedersen and myself that the evidence presented was being ignored. Wilson tried to convince Mr. Pedersen that he could not possibly want a new election. In the paperwork Mr. Pedersen sent you it is very clear that the UAW leadership does not follow the rules protecting the workers. They seem to bend the rules to accommodate the resolution they desire such as the ballot concerns on P.14 of his appeal. We expect that you, the Public Review Board Officers, not influenced by the UAW leadership, will give Mr. Pedersen's appeal an unbiased reading and question how something as important to our country's economy as a national ratification vote has fewer election rules and safe guards than a local union election. Mr. Pedersen's request for a new supervised ratification vote should be granted. For all of you UAW members who are concerned about the UAW leadership's actions and are deciding whether to continue paying dues please keep contacting me. I am hearing your unrest from members all across the country. L.A.W.S., Inc, Labor Advocacy Workers Solution, is a free agency which works for workers, retirees and their families. It has been in existence for over 20 years and has advocated for hundreds of workers and retirees. The agency advocates have made many trips to Washington, D.C. meeting with Senators, Congressmen, attended hearings including the Congressional Auto Hearings in 2008 most recently meeting with staff members of the congressional Education and Workforce Committee. It has contacted and worked with many government agencies including the NLRB, OLMS, USJD Racketeering and Fraud Division and MIOSHA. UAW Ford Vice President Jimmy Settles stated recently, ”There is no higher authority than the membership. Through a fair and democratic process UAW-Ford members have delivered job security and strong economic gains for their families.” If the UAW membership is the 'higher authority' why are we receiving complaints daily about the UAW leadership's actions? We are being contacted almost daily by UAW workers and retirees asking for our help. Due to the seriousness of his case LAWS has agreed to work with Robbie Peppinger who received a death threat from his local UAW president who apparently has not suffered any consequences due to this action. Read his story. My name is Robbie Pippenger. I was born and raised in Clinton County, Indiana. I have worked hard at Federal Mogul to produce high quality products for our customers for 9 years. Quality comes before production but safety comes before quality! a Clinton County Sheriff’s Deputy that day. I was shocked and did not go to work the next day as I tried to work through UAW to stop this safety hazard among us. On 07/28/16, I called UAW Solidarity House but they referred me to Region 2B. I called and told the Region 2B secretary about the text and she said she would leave a message about it with the Region 2B Director, Kenneth Lortz. He never responded! We have paid dues to be protected by the International and now they appeared to coddle Caldwell instead of stopping his dictatorial, thug like behavior that posed a safety hazard to the members. By 07/29/16, I was forced to bring this to the attention of Dan Frey at Federal Mogul HR. Mogul HR head also coddled the out of control UAW Chairman/President Caldwell. initiated a lawful petition to recall the out of control chairman/president Caldwell from office though the will of the membership. Our membership is less safe because if Caldwell did this to a UAW Steward without any apparent consequences there is no telling what he would do to a UAW member. On 08/03/16 Dan Frey did respond by saying that I was doing union business on the floor. This was not true since I was in the presence of 2 supervisors during the time in question. offender from the plant where the victim worked! to my advisers at L.A.W.S. INC., 269 998 4609. We have been hearing horror stories about what went on at many of the plants. Mary Tipton, a Milan Inergy worker and former ACH Ford worker tells us that “We ACH workers at the Milan, MI plant were Ford workers with Ford World Employment numbers. We were promised by Ford that if they sold a portion of the Milan plant we would remain Ford employees and would be moved to another Ford facility as full time Ford employees if and when a vacancy prevailed.” When Ford sold the business to Inergy Ron Esch HR for the Milan plant and Jodey Dunn of the UAW International told the workers that they could not move to a Ford Facility as there were no vacancies. If they were offered a job by Inergy they had to take it or be unemployed with no unemployment benefits. Some of the workers went to the Michigan Unemployment Agency to verify this fact. They were told that if they were offered a job by Inergy and did not take it they would be ineligible to receive unemployment benefits. When they took the Inergy job they lost their Ford status. It is interesting to note that some 'selected ACHers' were allowed to transfer to Ford facilities and maintain their Ford employment. Ford has since reopened part of the Milan plant as a Ford facility. The Dearborn Ford facilities reports concerning the National Ford Contract Ratification Voting are especially troubling. They reported intimidation, ballot fixing, improper ballots, workers being forced to vote at their job sites and UAW officials standing over them as they voted. "Electrical tradesman Art Pedersen of Detroit Ford reported to us that he voted on "a printed White ballot with no number" by checking 'yes' or 'no' and placed it in a bucket as names were checked and crossed off membership lists without any signature or initials given by the voters. Art's comment was not the only one we received. Reports keep coming in constantly. Art was interviewed by Rod Meloni at WDIV-TV. It may be viewed at http://www.clickondetroit.com/video/lawsuit-challenges-uaw-contract-vote. His grievance was denied by the union. He has appealed this decision to the Public Review Board. David McCuddin of Local 450 in Iowa who works at John Deere contacted us to say that many of his fellow workers are considering withdrawing from the UAW. He also stated that there is concern about the raising of the union dues and where the extra half hour of dues is going. An official from Local 450 contacted Solidarity House to and was told by UAW auditor William E. Stephen that these funds would go to the strike and defense fund. This is in addition to the 30% already being taken from the 2 hours that go into this fund. That means that approximately 43% of a member's union dues go into the strike and defense fund. Striking is not an option for all of our UAW members due to contract agreements and Right To Work laws. With grievances not being written and members not being represented properly who reaps the benefits of the defense fund? Is it the UAW officials, local and/or international, who find themselves in trouble such as the UAW local president in Michigan exceeded her income by $105,422.29? We have been told that the union will pay this money back. And now we have received word that Norwood Jewell's assistant Nancy Johnson has been relived of her position for alleged credit card fraud. Were any UAW credit cards used in this fraud? It is no wonder that many UAW members are considering withdrawing from the UAW. ​David McCuddin and group in Iowa are discouraged about paying dues for no representation. Attention UAW Members and All American Workers! On Monday, July 25, 2016 myself , a L.A.W.S., Inc. Board Member and several UAW members met with Rod Meloni of WDIV-TV Channel 4 Detroit, Michigan. He taped several interviews which, with lawyers' approval, we hope will be shown on TV soon. Following you will find short report on these interviews. Rod Meloni stated that he would look into the information given about the International and Local UAW leadership. David McCuddin: After fighting two grievances for four years and being fraudulently represented by UAW International Rep. Bobby Garland in March of this year, UAW Vice-President Norwood Jewell told David McCuddin's Local 450 Committee Chairman that the UAW would not pursue these grievances any further. Norwood Jewell transfered Bobby Garland to CAT after David McCuddin started an appeal to remove Bobby Garland from office. David can't proceed with the appeal, because Bobby Garland is no longer in his region. In all of David McCuddin's dealings with this matter, it seems that the dishonest people are protected more than the honest people. Patricia Meyer: I need people to know that I did sue the UAW International Union on behalf of the Ford ACHers now Faurecia workers in Saline, MI case# 2:13-cv-12485. I was told by Judge Nancy Edmonds that I could not pursue the lawsuit because I was not a worker. Larry Barker became the lead in a second lawsuit Case No. 14-cv-12997 along with approximately 191 plaintiffs. This lawsuit was allowed to stall past the time stricture and allowed to die. Art Pedersens appeal to the UAW IEB concerning the Ford ratification vote was denied. He is now appealing to the Public Review Board. It is now up to the lawyers whether this interview with Rod Meloni of WDIV-TV Channel 4 Detroit will be shown to the public. We wish to thank all of those who have come forward to share their information and especially Rod Meloni for being brave enough to try to bring to light what is really happening to the UAW members at the hands of their trusted UAW International and some Local leaders. We will keep you informed as to possible viewing dates. ​of the UAW International and some Locals. new information and of our future actions. On Wednesday, April 15, 2015 Patricia Meyer, Susan Alexander and Earl Wilk, Sr. of L.A.W.S., Inc. met with Congressman Bill Huizenga, Jon DeWitte and Zach Scott to bring them information from UAW workers and retirees concerning misrepresentation, misuse of funds and VEBA issues on the part of the UAW International Leadership. Huizenga's office has reached out to the Education and Workforce Committee with this information. We are looking forward to hearing from and working with the committee. Please continue to keep us informed about your concerns and what is happening to you! We realize the fight for justice is hard and ongoing ! We will continue our fight for you! On December 3, 2014 Judge Edmonds of the Federal Court asked for further information regarding the Barker ,at at VS. UAW International lawsuit. We will give you further information as soon as we have it. The following video was taped Monday, December 8, 2014. It shows two workers, Lisa Fuller of the Saline Faurecia Plant and Lorrie Bedard-Nettleton. of the Flint Buick City Truck and Bus Plant. They are telling their stories about dealing with the UAW in their plants and how they have not been represented properly. We encourage everyone, whether you are working now or are retired, to take the time to watch these interviews and to respond to us at kimshee97@att.net you opinions and what action you think should be taken on our part. the denial you may e-mail Art at mentor9001@aol.com. concerned about the actions of the UAW. Many are willing to come forward with their information. and misconduct. We are moving forward to bring your information and concerns to the public. Now is the time for you step forward with your concerns and information. Contact us! Stand up for justice! I attended Art Pedersen's May 24, 2016 hearing at UAW Local 600 concerning ballot tampering at the Ford Ratification Vote. This meeting was held six months after Art's original complaint. Al Wilson, Administrative Assistant to Dennis Williams, Jr. acted as moderator. Wilson asked Art if he was asking for a new ratification vote for the National Ford Contract. Art answered that he was. He said that he was there to protest the legality of the National Ford Ratification Vote. He brought two witnesses with him, Gary Walkowitz, Local 600 Shop Chairman and Nicholas Nickles. Gary Walkowitz testified that he witnessed the ballots from the voting barrels being dumped onto the tables to be counted. He noticed votes bundled together into packets. When a packet was opened all of the votes were yes votes. He questioned why these votes were clustered together in a packet when individual voters would place each ballot in separately. These ballots were green and white but they were not numbered. He also stated that there was voting in the DEP Committee Room. Nicholas Nickles told about how the election was extended two days after being posted for a shorter time. He stated that in 1978 he won a case concerning elections about how dates and times of elections could not be shifted. Al Wilson acknowledged that the Recording Secretary of UAW Local 600 did not follow the correct procedure after receiving Art Pedersen's complaint. David Freeman never sent Art proof that his claim was investigated. Art was just sent a one line denial. Wilson asked that all the information from the 600 Local Board investigation on which the denial was based be given to Art and to him. Wilson also announced that his opinion might not be given for 60 days. At the end of the meeting I made a statement and asked that the information and minutes from this meeting be given to UAW President Dennis Williams Jr. I also told him that he could contact Art or myself for more information. Wilson responded that he would not be contacting me. UAW workers, especially those in Ford. We are aware that you have faced and are still facing election and other concerns about your International and Local UAW leadership. Please keep on contacting us. We need to be aware of what is happening at your workplace. We have heard from Chicago, Louisville, Detroit, Toledo, Saline and Missouri UAW members who are concerned about what is happening. Only by working together will these problems be corrected. Feel free to contact me at269-998-4609 or through kimshee97@att.net. Please put disputethis in the subject line. After many years of trying to work with the UAW leadership to improve representation for UAW workers by both local and international leadership we are moving forward to bring our concerns to the public's attention. We have been working with the following UAW members who wish to bring to light what has happened to them and others. These people have had the courage to come forward and are becoming discouraged that no one seems to care about justice anymore. Do you have the courage to back them and stand up with them? Art Pedersen – Detroit Local 600 – Ford – National contract ratification voting fraud. He has followed all of the proper UAW procedures for filing a complaint. A complaint was also sent to Grant Thomas of the OLM. Calvin Buckmaster – Toledo Jeep – FICA was srongly taken out of signing bonus. Ford and GM employees received their FICA money back. Chrysler employees did not. He tried to file a grievance but was ignored. He worked for two years to get this situation corrected. He finally gave up. Mary Tipton – Ford – Miland – Inergy? - UAW Representative Jody Dunn failed to negotiate with Ford to save job status as Ford employees and the right to be moved to another Ford facility. 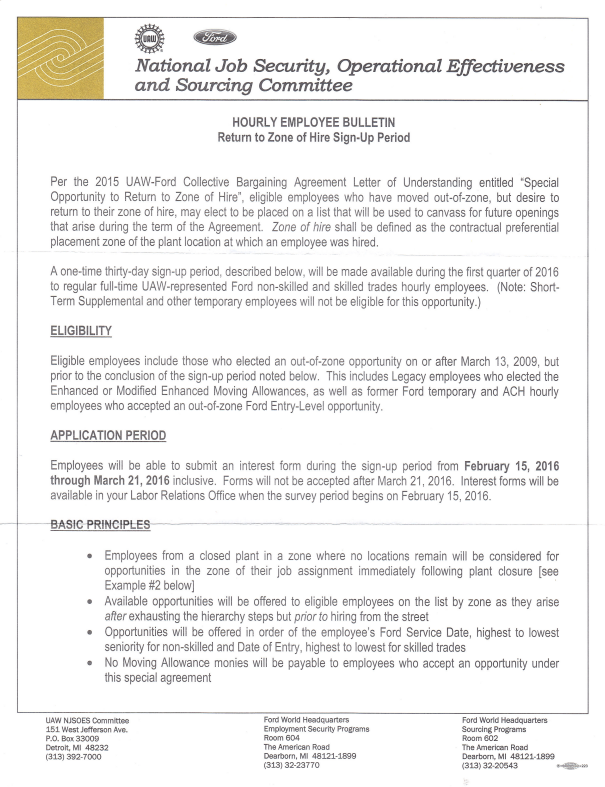 Candice Escott – Flatrock – Ford – Company and union working as a unit causing pay shortage. Failure on the part of UAW representatives to write and/or file grievances. Bettina Hilliard – Ford – Faurecia – Local election fraud. She followed the correct procedure ;by contacting the local recording secretary with her complaint. She also sent her complaint to Grant Thomas at the OLM. Lisa Fuller – Ford – Faurecia – Union representatives not filing grievances and telling UAW members that they had been filed leading to job loss. Laurie Bedard-Nettleton – GM – Flint – Lack of representation on the part of the UAW representatives of the Tier 2 employees at the Flint Truck and Bus facility. Laura Casillas – Ford – Lousiville, KY – A special deal was brokered by UAW Representative Jody Dunn to reinstate job seniority of two employees. They were told it has to be ;kept secret so other Tier 2 employees would not ask for it. Art Pedersen has been summoned to a Hearing regarding his ;complaints about the legality of the UAW-Ford Collective Bargaining Agreement vote on Tuesday, May 24, 2016 at 9:00 A.M. at the UAW Local Union 600 10550 Dix, Dearborn, MI. UAW Retiree Advocate LeRoy McKnight has provided us with a link to his radio program. I wish to thank Congressman Bill Huizenga (MI) and his staff for arranging for me to meet with the staff of the Congressional Workforce and Education Committee who have directed us to keep them informed of our actions. As always I wish you all the best. Stay strong. Support each other. Fight for justice for all workers. If you have information you feel I should have please contact me through kimshee97@att.net. Make sure you include the words dispute this on the subject line. At the present time we are working on getting the information we have about the actions and non-actions of the UAW International and Local Officials out to the public. Over several years we have tried to work with several Federal agencies concerning the actions of the UAW. They all tell us that our information is not in their jurisdiction or else they hide behind Washington's favorite, 'neither admit nor deny'. So they do nothing. The lack of checks and balances over the UAW International has allowed the UAW to do whatever they want including siding with the corporations. Unfortunately, you, the UAW workers are the victims. Following is an update on Art Pederson's, of Ford Local 600, appeal of the Ford National Contract Vote. Please take the time to read it. Observe the amount of time that has elapsed. This is common practice. The UAW often is allowed to drag its heels until time stipulations run out. As always our best to you. Keep on fighting. If you have any information you think we should know please contact me at 269-998-4609 or through kimshee97@att.net. We are compiling our information and getting ready to go public! We appreciate all of the information that has been coming in.! We will keep you informed of our actions! Attention all auto and private sector UAW members! Misrepresentation and corruption is still being reported daily by union workers throughout the country. In a case held in the Michigan Federal Court in Detroit in 2014 citing misrepresentation, loss of jobs and corruption within the international and local UAW, the plaintiffs were denied justice As you know from earlier Pat Speaks L.A.W.S. information concerning misrepresentation and corruption has been reported to the NLRB Office of Labor Management and most recently to the United States Justice Department's Office of Fraud and Racketeering. It is important that starting Monday, March 14, 2016 all workers' petitions and proofs be sent to L.A.W.S. at P.O. Box 112, West Olive, MI, 49460 or our website, www.disputethis.org, where you may leave your comments. Brothers and sisters of the UAW, remember that we believe in unionism. We hear your concerns and we are working on you behalf to help clean up the injustices in the International and Locals and once again become the UAW you all love. Art Pedersen of UAW Local 600 came forward to challenge the ratification of the Ford contract, He was interviewed by Rod Meloni of WDIV-TV Channel 4 in Detroit. This interview aired yesterday. Following is the link to the interview. Are you aware of the Ford papers providing for movement to other plants? Please read them carefully before you make any decisions. Unfortunately, many UAW members do not feel this way. and Local Representatives are supporting and protecting the companies' interests. and Candi Escott and read the Art Pedersen papers on our site please do so. If you have anything to report please contact me at kimshee97@att.net. Please put dispute this in the subject line. To view original PDF version click below. I wish to acknowledge Art Pedersen of UAW Local 600. He has had the courage to stand up and take action for what he believes. Art filed a complaint about the mishandling of the ballots during contract ratification. He followed the proper UAW procedures by filing his complaint with the Local 600 secretary. When it was denied he filed a complaint with UAW President Dennis Williams and the Public Review Board. This is the same board that has warned the UAW International Union about their practices in the past. Please click HERE to read Art's documents. It is you, the workers and retirees, who have said that you have been fraudulently misrepresented over the years. You need to stand up and become involved. It is your future. If you need help or have information to share with us contact us through kinshee97@att.net. Put dispute this in the subject line. We keep hearing from workers saying that their national contract ratification vote was not legal. If you wish to file a complaint about the ratification voting with the UAW it must be done before the end of January. Below you will the part of the UAW Constitution that you could site in your complaint. Also make sure you list what wrong doings you saw or experienced. Your complaint should be addressed to your local union recording secretary. If you receive a rejection please contact us al kimshee97@att.net and we will tell you the next step. Make sure you put disputethis on the subject line. Our investigations are progressing in our quest to bring to light the fraud and corruption in the UAW. Our goal is to bring your beloved union's operations back to was it was meant to be. New contacts are being made. Information we have recently received from workers has proven to be very important. If you have information about something that you think we need to know please contact us at kimshee97@att.net as soon as possible. Please enter dispute this information in the subject line. with the UAW International and Local leadership. We were originally told by the UAW Retiree Office that the GM retirees received the only bonuses from the new contracts. I have since learned that this information may not be correct. The other day I received an email from a retiree in Florida that the retirees were told at their UAW retiree meeting by the President of the Retiree Council that the Ford Motor retirees get $250 each year for (4) years of the new contract. If you are a surviving spouse of a retiree the amount is $250 each contract year. Chrysler retirees receive a $1000 payment toward a new vehicle. This voucher may be sold for the monetary amount. If you know anything about this please let us know if we are correct. Thank you! Have a happy and safe New Year! May 2016 bring us all peace and joy! I have just been informed by Becky from the Retirement Center of the UAW in Detroit that $500 checks will be issued for GM retirees on December 15, 2015. This was negotiated in the contract. UAW Local 699 members were asked to go back to work because they would cripple other plants. It is now out in the open that Nexteer is owned by China-based Pacific Century Motors. Michael Wayland and Melisa Burden tell us in their December 8, 2015 Detroit News article “UAW, Nexteer reach new deal following 20-hour strike” how Nexteer wages have been reduced so radically that many of the employees have to be still public assistance. In 2010 the local union agreed to a reduction in starting pay from $27-$28 an hour to about $12, which still leaves them at the poverty level. The UAW Local 699 members have expressed their dissatisfaction with their UAW leadership by their 97% rejection of the first tentative agreement. Nick Bunkley's Automotive News December 8, 2015 article “UAW members send another loud message to their leadership” states, “The union needs to bring its members together – even as their increasingly profitable employers play hard-ball - before they start to view their own leadership as the enemy, too.” Many of the UAW members have already reached this point. They want the UAW cleaned up and the corruption stopped. I highly recommend that you go to www.autonews.com and read this article. Congratulations to the Nexteer employees for standing up for what you believe. For those of you who do not know Nexteer in Saginaw, MI is owned by a China subsidiary. On December 7, 2015 we met with a representative from Congressman Bill Huizenga's office again and presented him with your information concerning the voting and contract time and others concerns that you have about the UAW International and Local leadership. We are waiting for feedback from that office. Remember – if you have concerns that need to be addressed you need to contact the NLRB and the OLM offices in your area. They need to hear from each of you. The more valid complaints they hear the more likely they are to pay attention to what you have to say. I'm glad to hear that you will be receiving your bonuses soon. You have earned them. Be prepared to pay a hefty amount in taxes. Cash them immediately. This should be a happy time for you with the settling of new contracts and the receiving of bonuses, however, I am sorry to say that many of you are still stressed, worried about your jobs, the legality of the contract vote and how you will be treated by your UAW representatives in your workplace. We are hearing daily from workers who are dissatisfied with their UAW International and local leadership. How your jobs were not protected. How the UAW allowed companies to remove the CAP which allows them to hire more temporaries, move jobs offshore and in some cases require more mandatory overtime. We are hearing from workers who are working in “slave-like” or “sweat shop” conditions and are being lied to constantly. One example is the former Ford plant in Saline, MI which is now owned by a foreign company. Ford workers were forced to give up their Ford employment status in order to work since there were not enough Ford jobs available to transfer into. Conditions became so bad that MIOSHA was called in by workers and with our urging inspected the plant. If bad conditions exist in your workplace either physical or mistreatment you, the workers, need to contact MIOSHA, the NLRB or OLM yourselves with your complaints. Make sure that you can prove what you say. These agencies should protect your identity. The more complaints they receive the more attention they will pay to what you have to say. Remember you pay dues to your union to act on your behalf. They are suppose to be working for you and not for the companies. Only you workers can stick together and stand up to the leadership and say, “This is not right. Changes need to be made.” Do not allow them to intimidate you. Since workers asked LAWS to help we have been working tirelessly to bring knowledge of your plight as UAW members to the attention of Washington. We have been to many agencies, contacted Congressmen and Senators and worked with several members of the media on your behalf. Most recently we have contacted the Justice Department Office of Racketeering and Fraud. Your evidence of misrepresentation and fraud on the part of the UAW leadership is currently being reviewed by them. If you have information you are willing to share with us please contact us at kimshee97@att.net. Do your job to the best of your ability! Keep your eyes and ears open and your mouths shut! Report to us what happens! fixed so please read yesterday's Pat Speaks again to find the correct story. If the UAW membership is the 'higher authority' why are we receiving complaints daily about the UAW leadership's actions? We have been hearing horror stories about what went on at many of the plants. The Dearborn Ford facilities reports are especially troubling; intimidation, ballot fixing, improper ballots, workers being forced to vote at their gob sites and UAW officials standing over them as they vote. Electrical tradesman Art Pedersen of Detroit Ford reported to us that he voted on "a printed White ballot with no number" by checking 'yes' or 'no' and placed it in a bucket as names were checked and crossed off membership lists without any signature or initials given by the voters. It was reported to us that paper ballots with no numbers were seen at the bottoms of voting barrels in clusters rubber banded together all with “yes” written on them. One employee in Detroit went to vote and was told she had already voted. We referred her to Dolores Boda of the Washington Office of the NLRB at 202-273-2887. If you have a voting complaint or other concerns call and report it. Are you aware that the CAP has been lifted at Ford, GM and Chrysler? It is our understanding that they can move work offshore. It was stated by a local reporter that he was told by union bargainers that the lifting of the CAP was to protect the Tiers in the bargaining. REALLY! How does moving jobs and allowing companies to hire more temporaries help you workers? We are hearing you and are working on your behalf. Your IUAW President Dennis Williams is not doing his job. When he first became UAW President he was proud of the fact that he quietly visited plants and union locals and no one recognized him. What kind of a leader behaves in this manner? We have been told by workers that he is the reason there is a Tier 2 system in the first place. We have tried to work with him on several occasions and have been ignored. Just today I once more talked with Washington about your situation. I was directed to contact the Department of Justice Racketeering Division by Attorney David Hatner who represents Howard Shapiro of the Department of Labor Fraud and Racketeering Office of Inspector General. We have been working with them for the last six months and they now tell us they can't help us. Congressman Bill Huizenga of Michigan connected us to the Congressional Education and Workforce Committee representatives who have advised us to contact the OLM and the NLRB which we have once again. They instructed us to keep them informed of our actions. We will continue to work on your behalf. What is happening to you is not ethical. If you have complaints or wish to report what you have seen in order for us to help you, you have to be willing to come forward. Please keep us informed but also contact Dolores Boda at the NLRB in Washington (NOT MICHIGAN ) at 202-273-2887. If you do not reach her directly leave a message including your name and contact information. The more workers who are willing to step forward the more the NLRB will listen to you. Make them listen to you! It is your future and your family's! up for what you think is right! It is critical for your future that you continue to do so! Continue to keep us informed! We have received news that the Louisville Ford Plant is losing the Lincoln line. Will all of their jobs be retained? Mary Tipton, a Milan Inergy worker and former ACH Ford worker tells us that “We ACH workers at the Milan, MI plant were Ford workers with Ford World Employment numbers. We were promised by Ford that if they sold a portion of the Milan plant we would remain Ford employees and would be moved to another Ford facility as full time Ford employees if and when a vacancy prevailed.” When Ford sold the business to Inergy Ron Esch HR for the Milan plant and Jodey Dunn of the UAW International told the workers that they could not move to a Ford Facility as there were no vacancies. If they were offered a job by Inergy they had to take it or be unemployed with no unemployment benefits. Some of the workers went to the Michigan Unemployment Agency to verify this fact. They were told that if they were offered a job by Inergy and did not take it they would be ineligible to receive unemployment benefits. When they took the Inergy job they lost their Ford status. Art Pedersen has appealed to UAW President Dennis Williams office the 2011 FORD CBA, specifically the Profit Sharing Language. He questions the interpretation and application of the Profit Sharing Formula. The CBA states that the Profit Sharing plan is not subject to the grievance procedure. A dispute can be submitted to a third party mediator for resolution. After going through the Appeal process to completion at the Office of the UAW President the end result was a response from Jimmy Settles and Al Wilson basically acknowledging his position but denying that anything was wrong with the formula and that is was purposely negotiated that way. Art figures the loss in compensation to the UAW members at Ford Motor Company totals roughly $300 million over the life of the 2011 Agreement. The numbers he laid out for the IUAW show almost 17 million hours in 2013 and almost 19 million hours in 2014 that the Ford Motor Company did not pay Profit Sharing on. WATCH OUT FOR WHAT IS IN YOUR CONTRACT! I recently read an article in the Detroit Free Press entitled “CEO: FCA-UAW conrtact to cost nearly $2 billion more.” It states 'The new four-year UAW contract could cost Fiat Chrysler Automobiles an additional $2 billion over the life of the contract and will force the automaker to cut costs or raise vehicle prices, CEO Sergio Marchionne said Wednesday during a call with investors about third-quarter earnings.' 1. Could those be scare tactics from Chrysler intended to turn the American people against the Chrysler workers by further picturing the workers as money grubbers? Why would FCA even have proposed the contract changes if they thought it would cause the company to fail? It only stands to reason that the UAW would not promote changes that would cause all the jobs they have pledged to save to disappear. Hold your heads up high and do your jobs to the best of your ability! Ford and the UAW have reached a tentative agreement. Ford workers make sure that you attend the informational meetings and ask the hard questions. Don't leave the decisions up to the next guy! WORKFORCE: The new Chrysler contract allows the temporary hiring cap to be removed. Temporary workers can work any day of the week. Temps will no longer receive profit sharing as they did in the past. As Tier I and Tier II workers retire they will be replaced by temps who will never become full time workers. The future work force may become a temporary workforce. WAGES: The Chrysler contract allows the path to $29.00 for Tier II workers in eight years, however, this could end in four years with the next contract. The UAW is aware of this fact and still have allowed it to happen. With the addition of more temporary workers there will still be a disparity of wages for workers doing the same job. The temporary workers will never be allowed to reach $29.00. How will profit sharing work? How about signing bonuses? Be Prepared to Ask the Hard Questions! WORK SCHEDULES: Will the contract allow the company to demand mandatory consecutive 7 day 12 hour shifts? Could refusing excessive work shifts affect your employment? Will there be a family medical leave act? How about death benefits and leave time? What is the absence policy? HEALTH CARE: Will the Tier I and Tier II workers have to pay deductibles? Will Tier I and Tier II workers have the same health care coverage? Will the temporary workers receive any health care coverage? The Chrysler temporary workers will receive no health care coverage, no prescription, dental or vision in the new contract. Health care coverage is vital for all employees! Be an Informed Voter! Attend Contract Information Meetings! Speak Up and Ask the Hard Questions! It has been brought to our attention that a survey of complaints be placed under our "Contact Us" section by as many U.A.W. members as possible. If you have information concerning misrepresentation of the U.A.W., please comment immediately by clicking on the "Contact Us" tab in the top right corner of this website. We are informing government agencies of corruption and misrepresentation. Please pass this information and the name of our website on to the brothers and sisters of the U.A.W. It's time all of us STAND UP FOR JUSTICE! Thank you for your help! Attention all U.A.W. Members: We have learned that the U.A.W. membership refused the Chrysler agreement. We have learned that the U.A.W. leadership agreed to a second agreement with Chrysler only after workers stood up and said no to a first agreement. Remember to thoroughly check out all the terms and conditions of the second agreement before you sign the agreement. Also remember you do not have to agree to a second agreement unless you agree with all of the terms and conditions. U.A.W. Auto Workers: Did you know that private sector workers in areas such as health care, insurance agencies, casinos, small job shops and many others are asking the question: "What about us?" All U.A.W. members need to STAND UP and tell the U.A.W. leadership they deserve proper representation for their interests, not the company's. For further information contact us via e-mail Kimshee97@att.net or visit the website www.disputethis.org. all auto and suppliers' plants for years not just in Michigan but throughout the country. quiet. Remember these companies are still taking work offshore. Attend your Local meetings, make comments and ask questions. health related, need to stick together and fight for your rights. 2. 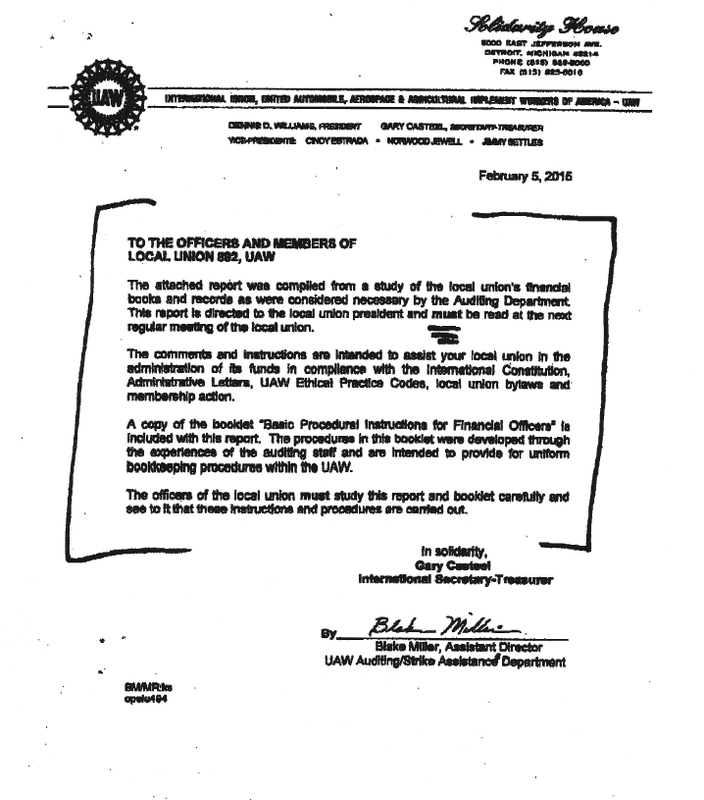 Violations of the National Contract and the UAW Constitution. Watch the interview on the page linked . Please wait through a short pause near the beginning of the video. Following Lori's letters is new information just in from Kansas City, Missouri. Workers are calling us with concerns about negotiations and contracts. We have been informed that UAW International and Local Officials including Jodey Dunn are suddenly appearing or planning to appear in Ford plants checking our conditions and talking to the workers promising the best contract ever for the next four years. When they come on the floor of your plant be prepared to ask them the hard questions such as will grievances be written, filed and acted upon since this has not been happening . I am sure that there are other concerns that you need answers for. Given all your problems you need to stick together and support one another. If contacted by the media be prepared to talk with them. We have learned that the workers at the Faurecia Saline, MI plant, previously Ford, are working in near sweatshop conditions. The workers voted down the first contract. They are now being told that they had better vote yes on the August 5, 2015 contract vote because that is the best the UAW were able to negotiate with the company. LAWS, Inc. is working with all areas of the auto industry. After making several attempts to work with UAW International President Dennis Williams, Jr. and International Representative Jodey Dunn we have taken information to the Congressional Education and Workforce Committee in Washington, D.C. and OSHA because of sweatshop like working conditions in some plants. As always, keep us informed. E-mail kimshee97@att.net or call 269-998-4609. Members of the LAWS, Inc. Board and I were in Washington, D.C. this week. Our mission was to meet with representatives of the Congressional Education and Workforce Committee to seek assistance for UAW workers who are not being properly represented, poor working conditions and other concerns leading some members to consider requesting their dues back. We also presented the UAW retirees' concerns about the loss of benefits and the fear of possible pension loss. As we told you earlier we had already approached both Senator Stabenow and Senator Peters about these concerns. Unfortunately we were ignored. While we were in Washington we stopped by their offices to talk with their staffers and leave more information with them. We feel it is time that they do something for the working man. With the contact negotiations in session If you are concerned about your working conditions, UAW representation, the loss of health benefits and possible loss of pensions it is important that you let your Congressman and both Senators know what your fears are. Also report any wrong doing on the part of your union or employer. This is a letter to appeal the triennial election held May 20, 2015 at 601 Woodland Drive Saline Mi 48176. Following is a list of misconduct during the election. Attached is proof (pictures) of some of the allegations. #7 states that there will be a challengers meeting 45 minutes prior to the election and challengers will be issued challenger badges and rules. There were no such meetings held 45 minutes prior to elections and badges were not worn. #8 states that any challenger unwilling or unable to observe the rules will be asked to leave. Challengers were not given the rules at this time because there was no meeting and were not asked to leave. #9 Challengers must sign in and out each time they leave the voting area. The challengers never signed in and out when leaving or entering voting areas. Election committee to provide sing in/out sheet if it exists. Second are violations of the "Guide for local Union election committees"
1. Chapter 4 states who may run for office and eligibility requirements. Now that the election is over there were facts brought up about a candidate that was on the ballot that was in violation of (Sec U.S.C. 504) during the prior term that violated this section by signing the acceptance for the prior election knowing they had a felony. Section 504 8) states that there is a penalty for signing this form that states the nature of eligibility and validating that they meet the requirements and are eligible and this was signed by the candidate. 2. Campaign guidelines state that all candidates get treated equally. There were candidates that were allowed to speak at Union meeting for retirees and other candidates that were not notified. 3. There were numerous occasions that the ballot box was left unattended or with only one person with it. See attached pictures. Also there was campaign material lying right next to the ballot box. See attached pictures. In closing I believe that under chapter 15 that there is a substantiated showing of fraud and loose practices in conducting the election. I am asking that the election be voided and redone. You have been notified that the contract has been settled. I have received phone calls concerning the agreement. 1. 10 points from June 2015 to June 2016. Points last for a year to the date issued. 2. 50 cent raise per hour from 2015 to 2018. You will top out at $17.50 per hour. 3. New hires will be getting $12.50 per hour to start. 4. Health insurance will be cheaper per week but no longer Blue Cross Blue Shield. 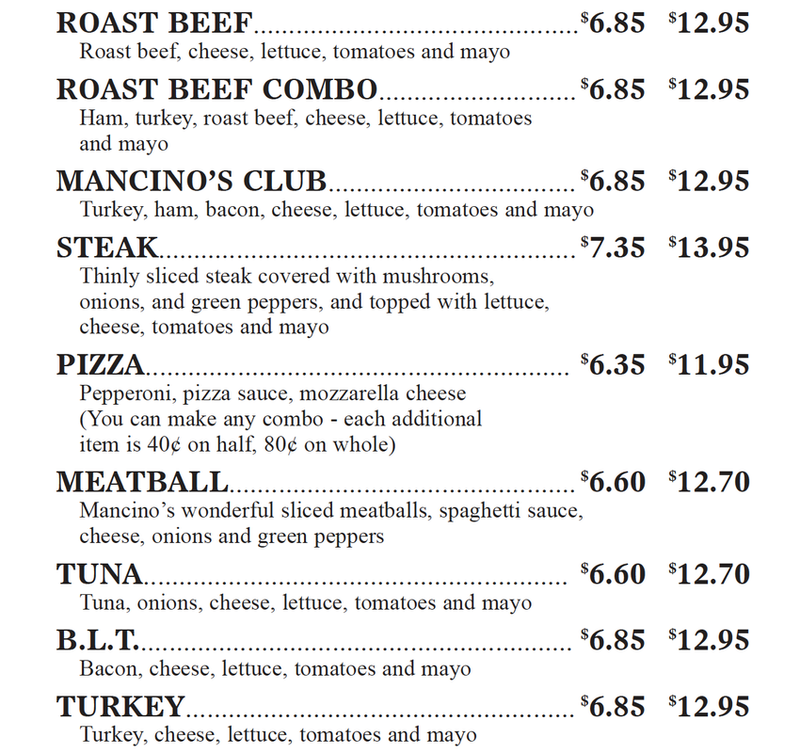 call 313-926-5000 and ask for Public Relations. Tell them you need the white book. REMEMBER, IF YOU DO NOT VOTE YOU WILL BE COUNTED AS A "YES" VOTE. the 13 year restriction ran out. Ruling Section 504 states that a felon not allowed to run for election for 13 years. He was sentenced in 2000. 2. The new hires hand wrote their ballots and put them in envelopes instead of using valid ballots. 3. The ballot boxes were taken home in the personal cars of the election officials which is against the rules. 4. Terry McHutchinson of Faurecia and Jason Heath were making deals under the table. others that the election was invalid. white book and read it carefully. Get out and vote and stand up for what you believe. Information on misrepresentation and fraud on the part of the UAW International and Local Leadership has been given to my Congressman Bill Huizenga. He has sent this information on to the Congressional Education and Workforce Committee headed by Congressman John Kline of Minnesota. This information is being studied by their lawyers at this time. We hope to hear from them soon. On Monday, June 8 we met with Senator Gary Peter's Southwest Regional Director Don DeFoe and Kala Smith , the Constituent Services Director. Senator Peters was unable to attend the meeting. Information regarding misrepresentation, fraud and bad working conditions on the part of the UAW International and Local Leadership was presented to them. They were asked to present this material to Senator Peters and to encourage him to contact UAW President Dennis Williams, Jr. and ask him to look into these claims and to do what is needed to correct these situations. We are still working with Melissa Gibbons and John Gilbert, Jr. 's information. Keep on working and your chin up high! Keep us informed as to what is happening. We are awaiting an answer from him. informed about what is happening. Keep watching this site for further updates. My name is Patricia Meyer and I am Director of L.A.W.S., Inc. Over the last 20 years I have been contacted numerous times by private sector workers, auto workers and retirees who as UAW members are concerned about the actions and/or non-action of the UAW leadership. On August 6, 2012 I wrote to then President Bob King about the workers' concerns and on October 10, 2012 I went to Solidarity House and spoke with lawyer Sharma Manessa to explain the problems the UAW workers were facing in several of the plants. Unfortunately I received no response from the UAW leadership either time. As a new president unfamiliar with the workings of the auto industry I am sending you the following information to help make you aware of what has and still is happening to your UAW members. Many members are feeling a lack of representation, grievances not being taken or not being heard when they are taken, misinformation purposely being given to the workers, voting infractions and union dues being collected improperly, this can be proven, which are causing the workers to become demoralized and to accuse the UAW of becoming a "company union." It concerns me that several UAW representatives have been mentioned over and over again as being the culprits of the actions listed above. The names mentioned most often are: Jodey Dunn, Jason Heath, John Moore, Tom Keanitz, Roy Gamble, Todd Dunn, Barry Ford, Joe Goddard, Cal Rapson, Jimmy Settles, Jr., Norwood Jewel and General Holliefield. The UAW workers and retirees who have contacted me are true union members and are placing their faith and hopes in your hands to truly correct the ills of the UAW and to support its members like they have supported the UAW throughout their working careers. Many of these workers have become afraid to speak up because they fear losing their jobs. Problems in the plants seem to be escalating daily. Please read this information and the letters included from your UAW worker members and retirees. The attitudes and actions of your UAW representatives must be changed. Immediate action needs to be taken. You have stated that the former UAW President failed to be present for his UAW auto member workers. We appreciate the fact that you are making visits to the locals, however, how can you be proud that when you go into an auto factory your UAW members don't know who you are? You cannot expect the average UAW member to support you during the auto negotiations if they do not know who you are and that you care about their situations and will fight for them. In our society today our young people have been encouraged to question and challenge leadership. You must gain their trust by being honest, straight forward and willing to correct what is wrong with this union. If you want to gain the workers' trust and their desire to remain an UAW member you must promptly deal with the people mentioned above. Any corrupt or unfair actions on their part must be corrected immediately. Many of your UAW worker members are totally beaten down and feel the UAW does nothing for them. Their word of mouth may make the difference in your recruiting. Do not forget your retirees! They are not allowed any say in what goes on, are expected to continue to pay their retiree dues, and are at the mercy of what the UAW leadership does at negotiations. Retirees from all 'the Big 3' companies fear for their health insurance and pensions. This union owes them its protection after all their years of loyalty. UAW members continue to contact me daily. It is important that I know your feelings concerning the enclosed information and the actions you intend to take. A meeting with you and the above mentioned UAW representatives to discuss their actions and your decisions is imperative as soon as possible. My contact information can be found at the top of this letter. If you need any additional information please feel free to contact me. I have at least 181 more workers' concerns I can send you. 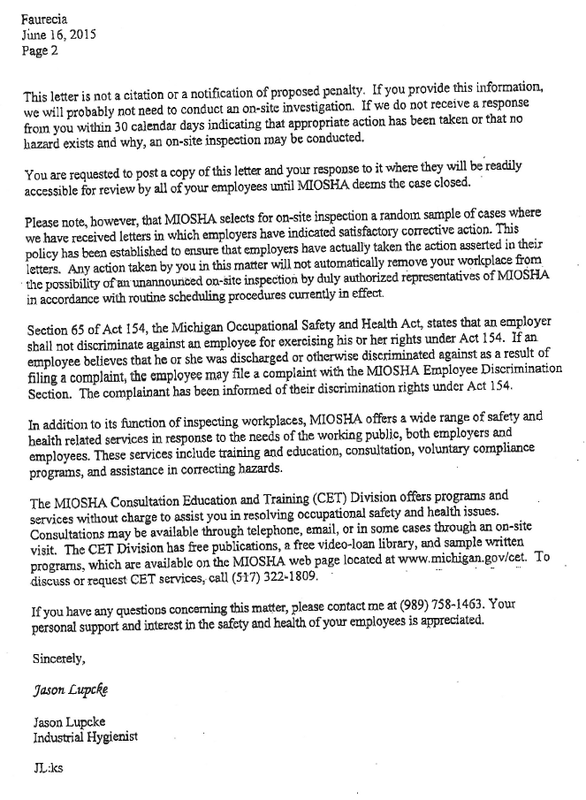 One week from the day of delivery of this packet this letter along with other information will be posted on our website disputethis.org and given to the media and federal agencies including the NLRB who has been working with us. I look forward to hearing from you within this week and working with you to help the UAW become whole once more. It's time the people know who you are and you help your members! is thought to be "on notice"
maneuvered so the ACHers lawsuit was not heard by the court. I am sorry that the lawsuit was dismissed. The UAW who took away your vote, your right of representation and your seniority had the power and connections to help bring about this dismissal. For your information Attorney Jonathan Browning only received $20,800.00 for a year's worth of hard work and two appearances in Federal Court. He was up against a very powerful organization who used your dues to help defeat you. It is also important the you understand that no one in my organization has received any salary for all of the work that has been done on your behalf. This lawsuit dismissal should be looked at as a sign to keep on fighting. Now is not the time to stop! You will notice that in Jonathan's letter it is mentioned that I will be willing to request a meeting on behalf of you with UAW President Dennis Williams. If I contacted his office today to set up a meeting I would be automatically refused. In order to bring this meeting about I need the co-operation and participation of everyone who feels that the UAW has let them down, lawsuit member and otherwise. You ACHers should realize that it is not just you that are being treated badly. All workers are suffering to some degree. It is only by standing together as a group will enough pressure be applied to make the UAW leadership wake up and take notice. One or two people per plant will not be able to change anything! Now is the time for you to become pro-active. I am asking that you take the time to write a letter addressed to President Dennis Williams telling him what has happened and is still happening to you and how the UAW has let you down. Encourage those around you to also participate. The more letters the better. Send your letter to Patricia Meyer, Box 112, West Olive, MI 49460 by January 10, 2015. These letters will be presented in one large group to UAW President Dennis Williams. The more plants and workers that participate the greater impact they will make. These letters will also be shared with reporters who have discovered the truth and are willing to let the public know the "real" situation. 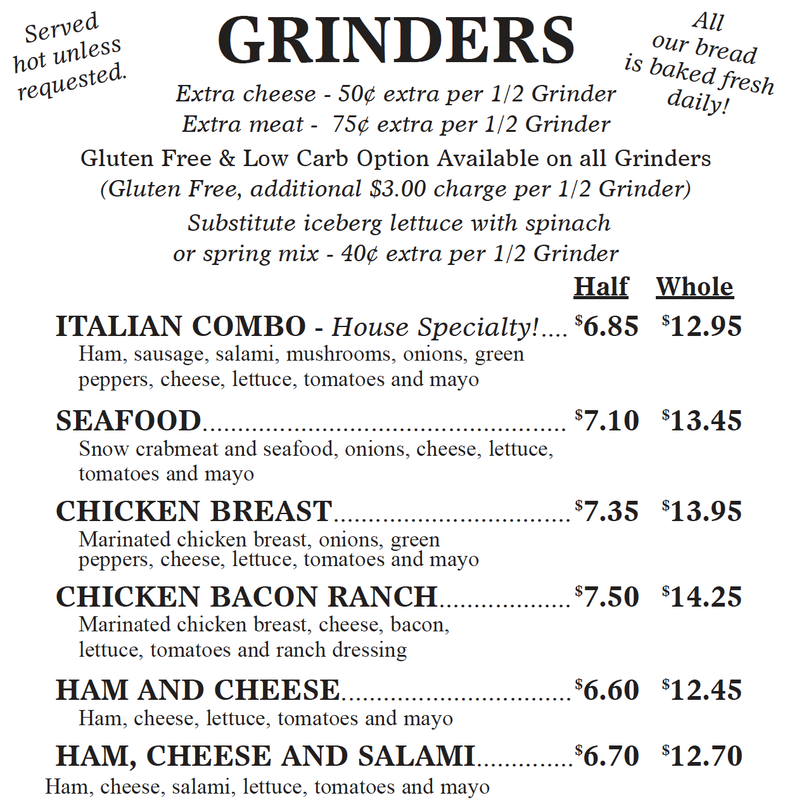 If you have any questions or suggestions please feel free to contact me at 269-998-4609. I want to remind you to keep checking disputethis.org for news and any developments. Make sure that you take the time to read Lisa Fuller and Lorrie Bedard-Nettleton's information. This website is dedicated to workers and retirees who are union members across the nation. work floor situations due to lack of representation. happening to both. We need to stick together. Let everyone know about this site and encourage them to learn what is really going on. kimshee97@att.net. Please write dispute this in the message line. happenings and how workers are being effected. Jason Heath of the Saline MI Faurecia Plant. I want to thank all of the ACH lawsuit participants some several plants, other UAW members and members of the public who attended the meeting on Sunday, September 21, 2014 at Western Michigan University. The speakers who spoke about "Justice For All" opened our eyes as to what is happening in our country and around the world. Leroy McKnight, a UAW retiree and advocate, pointed out to us the fact that we must continue fighting for our rights as changes that are not to the UAW members and families benefits may be coming in the near future. He told us that we must be diligent and to insist upon justice for the workers and the retirees. As you know I am continuing to keep the federal government and state officials aware of what is happening to all of the UAW members and retirees. Please feel free to contact me with any information you think that I should know or any questions you might have. LAWS has been working closely with some of the workers at the Toledo, OH Jeep Plant. Following is a letter I received from a worker who has been trying to right a wrong to the Chrysler workers. of our upfront signing bonuses, I have had no success with the UAW or Chrysler to address this issue. I feel I have spent hundreds of hours and my time and my money pursuing this matter to no avail. Unfortunately I am unable to proceed any further without cooperation from the UAW, Chrysler or even the Government Agency involved. I feel it will take an army to win the rights of our UAW members, because we're not being represented fairly in this matter. The ACH lawsuit against the UAW Leadership has been re-filed and re-served (ACH plaintiffs vs. the UAW). This was necessary because Judge Nancy Edmonds of the U.S. District Court Eastern District of Michigan ruled that I, Patricia Meyer, not being an ACHer myself, was not eligible to bring this suit on behalf of the ACHers. I was approached by workers at the Saline, Michigan Ford Plant now known as Faurecia. The workers needed help and unfortunately the UAW Leadership would do nothing to help these workers. In fact it appeared that they were working on behalf of the company rather than on the side of the UAW members who were paying union dues to be fairly represented by their union and have their rights protected. I took their concerns to the National Labor Relations Board in Washington, D.C. The case was investigated by the Grand Rapids office and then was assigned to the Detroit NLRB office. It was decided that they were unable to help these workers. This case was also presented to the Labor Department who was unable to help but advised me to hire a lawyer. In August of 2012 Jody Dunn, the UAW International Servicing Representative for Ford Department, advised me to contact the UAW International Headquarters to ask for help for these workers. On August 10, 2012 I met with a UAW lawyer at Solidarity House and on August 6, 2012 a letter to President Bob King and Jimmy Settles explaining what was happening. I received no response. May 31, 2013 I filed a lawsuit on behalf of the ACH workers against the UAW Leadership in the U.S. District Court Eastern District of Michigan. 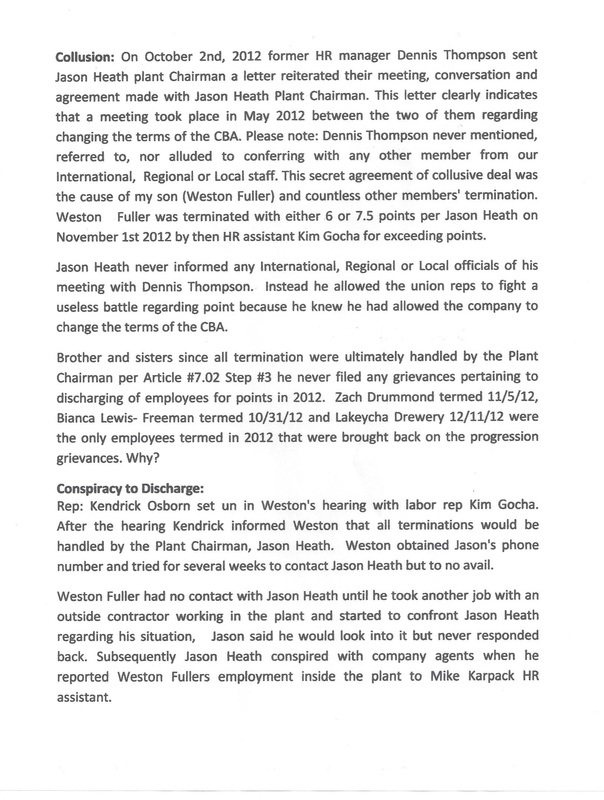 On December 2, 2013 the UAW International Leadership was served with lawsuit papers. Following you will find documents that will be of interest. Please feel free to read them. After talking to workers in many plants who are working for several companies it has become apparent to me that the ACH workers are not the only ones who have found that the UAW International Leadership has not been representing them properly. It is time that all the UAW members who have been injured and betrayed by the very bargaining unit that is supposed to protect your rights stand up and work together. Join the movement to clean out the corruption. For many years the UAW leadership has failed to represent its union workers at many levels allowing corporations to dictate wage decreases, eliminate medical coverage, underpay into pension funds and reduce the work force while moving manufacturing and technology offshore. It has now reached the point where workers are asking for their union dues back because they feel betrayed by the very people who are supposed to be fighting for them. Following are a few examples of this that have been brought to our attention. 1. Union representatives in the plants not being available and/or refusing to write grievances. 2. Ford Temporary workers, known as ACHers being denied Ford entry employment while the union stands by and allows non-union employment agencies to fill these jobs. 3. Temporary workers, who have been paying union dues and have been promised permanent employment after 90 days, have received no union representation when they have reached 90 days and are refused permanent employment. 5. Allowing contracts to be reopened for renegotiation without the workers knowledge and agreement. After meeting at the park and listening to their concerns it was decided to approach the UAW Local 892 leadership, the Labor Department and the NLRB. Then Local 892 President Mark Caruso and President Hug of the Ford Sheldon complex met with us in the Local 892 union hall. Hug stated that she was still negotiating for the temp workers and told Caruso that she did not feel he should picket the plant. He did decide to picket the plant in July. Consequently he was removed from the Saline plant and placed in the MAP plant before his date of transfer thus leaving the Saline plant in the hands of Malena Hubbard the new UAW Local 892 President. We have in our possession seniority lists that clearly show nepotism and favoritism coming out of the Rawsonville and Sterling Heights Ford plants clearly affecting ACHers trying to move from the Faurecia Saline, MI plant to Ford facilities. Also of major concern is UAW election fraud in the Saline plant where ACHers were not allowed to vote but temps and retirees were. The workers have asked L.A.W.S., Inc. to meet with UAW President Bob King and Vice President Jimmy Settles, Jr., neither whom anyone has been able to contact up to this point, to explain this situation and request that the UAW help right the wrongs that have befallen these workers. Another problem that has been brought to our attention is the recent FICA checks that Ford and GM have sent to active and retired workers who took signing bonuses in 1996, 1999 and/or 2003. Some of them have asked if they could write grievances against GM and Ford because they were only receiving 35%. Who is receiving the interest? In investigating this problem we have been led to believe that certain UAW Region officials were given checks that amounted to more than 35% of the signing bonuses. Your UAW members are entitled to a clarification. Was the UAW leadership paid to step aside in this matter? There are other vital issues that need to be addressed. One of your UAW representatives, Jody Dunn, encouraged me to contact the UAW Legal Department. Due to the magnitude of our concerns is would seem appropriate to me that a meeting be held including President Bob King and Vice President Jimmy Settles, Jr. within the next seven days. I may be reached at 269-998-4609 or by e-mail at kimshee97@att.net with the time, date and location of this meeting. I have received several messages lately and I can tell from your questions and comments that some of you have some confusion about what is happening with the ACH lawsuit. I hope that this letter will answer your questions and relieve your concerns. I was first contacted by Debbie Muncy on behalf of the ACHers at the Saline, MI Faurecia plant. After meeting with them I went to Washington, D.C. where I met with staff members of both the National Labor Relations Board and the Labor Department with their concerns. The case was referred to the Detroit NLRB office where it was determined that they could offer no help. The Labor Department also informed me that they could offer no help but Ian Burg of that department suggested that we hire a private attorney. Debbie Muncy contacted an attorney in Cleveland, Ohio who stated that he would take the case if everyone paid $1,000. Not enough ACHers were able to join so he withdrew from the case. Another attorney was contacted in Jackson, MI and it was decided that a lawsuit would be filed against the UAW. The attorney from Jackson was to accompany me on May 30, 2012 to file this lawsuit. He never appeared so it was decided that Debby Muncy and I decided that one person would bring the lawsuit against the UAW on behalf of the ACHers so I was chosen to do so. A search was begun for a new attorney. The Dodge and Dodge law firm in Grand Rapids was contacted and agreed to take the case. David Dodge, Jr assigned the case to Jonathan Browning who co-counsels on many cases with Dodge & Dodge, particularly labor and employment cases. Dodge & Dodge eventually decided to let Mr. Browning handle the case on his own. Mr. Browning only asked for $100 from each plaintiff to begin the lawsuit. Because of expenses he has now had to ask for another $100. The monies for the case are being paid to Jonathan Browning or Earl Wilk, Sr., a member of the LAWS, Inc. board. This money is being put to good use. An accounting of all expenses will be made available at a future date. On April 16, 2014 a press conference was held at the Barristers Building in Grand Rapids, Michigan. Channel 8 WOOD TV Investigative Reporter Henry Erb and a reporter from the Grand Rapids press attended. Attorney Browning and a few of the ACH plaintiffs spoke and answered questions from Mr. Erb. After the conference Mr. Erb told me that he was going to follow up on the information he learned and contact the UAW International Union for information from them. A DVD was made by us of the press conference. A few copies of them have been sent to some ACHers in several of the plants who are going to share them with the other plaintiffs. I hope that you will be able to view one. If you are unable to find one contact me at kimshee97@att.net and include your address as it will be mailed to you. Apparently some of the ACHers have contacted Debbie Muncy to find out the status of the lawsuit. It is important that you understand that this lawsuit was filed solely by me, Patricia Meyer because Debbie Muncy stepped aside maybe because she is still part of Ford or because of the seriousness of her injuries. I have not been working with her nor have I heard from her. As you have heard the UAW International is asking for a dues raise of 25% by all of its working members and 50% for the retirees. This includes all of the membership be they auto workers, small job shops or professionals such as nurses. A vote will be taken on June 2, 2014 in Detroit. I have been told by a worker who was elected to be a delegate to this vote that he will not be allowed to vote. It will be done only by a chosen few so that it will be sure to pass. I would recommend that you let everyone in your plant know about this and express your dissatisfaction on the dues increase. If you have any questions about this please feel free to contact me at 269-998-4609. A meeting is being held on Sunday, May 18, 2014 in Saline, MI where ACH plaintiffs may meet and ask questions of Attorney Jonathan Browning. Hope to see you there. On Wednesday, April 16 2014 a news conference was held at the Barrister Building in Grand Rapids, Michigan regarding the Ford ACH workers lawsuit against the UAW International leadership. Attorney Jonathan Browning, Patricia Meyer and several plaintiffs spoke. Jonathan Browning explained the reasons for the lawsuit and commended the workers who have come forward to tell their stories. In attendance were Henry Erb, Investigative Reporter for WOOD TV and John Agar, political reporter for the Grand Rapids Press along with several other interested parties. A report of this news conference may be found at WoodTV.com/2014/4/16/temp. As a result of this news conference several auto workers throughout the country are commending the actions that you are taking. I have also heard from workers in other fields who are telling me that they have also experienced the same type of treatment. Some are UAW members and some belong to different unions. This shows me that the policing of all unions is needed. Be aware that not every union member will agree with what we are doing and you may run into some negative responses . Some may already be circulating in your plants. One that we have already heard is that temporary workers have no right to union representation. Apparently they do not understand that you have been paying union dues for 5 1/2 years before this lawsuit came about. Keep watching the site for more information and announcements. Be strong for one another.! What? You want to raise my dues 25%? ”There are tremendous sacrifices made by members that concern us all"
* But the UAW can still afford a $22,992 cable/direct TV bill? "These days the fight...(is with)...billionaire-funded groups"
* UAW leaders act like billionaires, subsidizing their golf resort over $5,000,000 a year. "PRO-member has several elements, including improving communications... and cutting cost." hotels, and 1/3 million in car rentals? "A robust strike fund is the strongest deterrent to an employer..."
* Then why does the UAW keep drawing from it? "dues increase will go only to this fund... and cannot be used for partisan political activity." * But can, and will, be used for non-partisan political activities. "15 million in annual spending cuts by the International"
* That's about 5% of UAW spending. They are asking for a 25% increase from us. "UAW reduced staff by 38%... OPEIU has a 51% reduction"
"Additional planned or proposed reductions include..."
Spending is for the year 2012.